What is a Facade Grant? 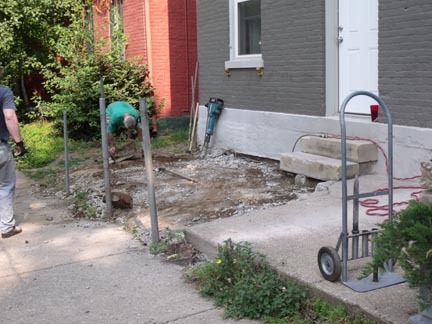 "The Covington Residential Facade Program, funded through the Community Development Block Grant Program, is administered by the City of Covington's Community Development Department. The purpose of the program is to assist home owners with improvement to facades (visible from the public right-of-way) of qualifying residential properties." "Households interested in participating must submit a pre-application with required information. Households determined to be eligible will then complete a formal application and provide additional documentation." So, what did we do? 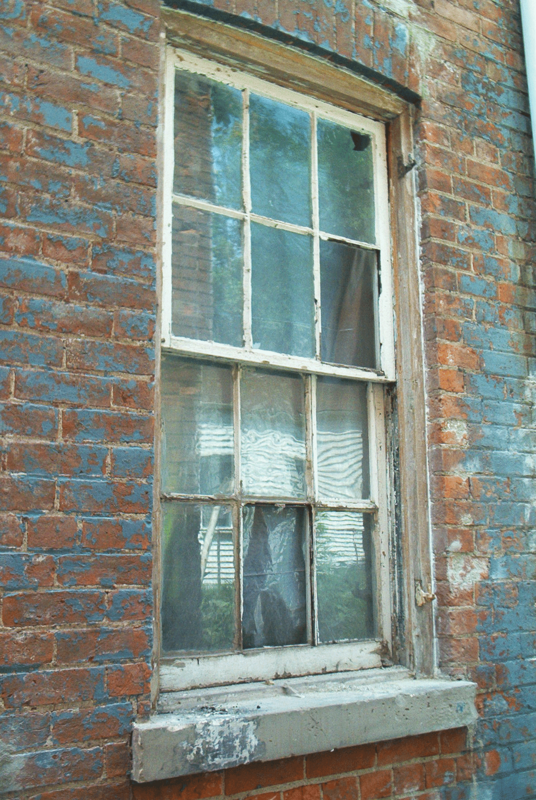 (besides stop working on our front 'yard' back in April of 2011 and wait for a grant...) Well, we applied for the grant. The grant is for a minimum of $1000 and a maximum of $5000 for owner occupied homes, and for rental properties it's a $1000 minimum with a max of $2500, but the owner must contribute a matching amount of funds to the project. Seems worth the effort, eh? We submitted the pre-application on June 30th, and were told it was on a first come - first served basis. We got to City hall at 8:30 AM to drop of the application. We were not the first in line. We weren't even the tenth. There were LOTS of applications put in before ours. We were late and it didn't look good for our possibilities. A year later, as you know by now, I said enough was enough -- get the ball rolling without the grant. So phase one is still underway, but mostly done. Maybe installing the wrought iron fence will just have to be phase two. What's hilarious is that we were contacted by the City Development Program just as we were dumping the dirt into the new front yard. It took a year to get around to us, but they were proceeding with the grant application process and wanted to meet with us. Once they establish that we meet their requirements, they will then drop by to find out what we plan on doing. We'll let you know how that goes in a few months. Until then, I'll be attempting to outline the plan here, as well as get estimates on the cost. 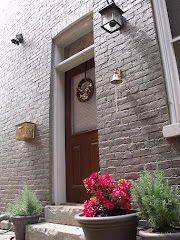 Covington Facade Grant...and a front yard. So why does a facade grant put things on hold? Well, because you suddenly stop and think, 'this was going to cost a heckofalot of money... if the city is willing to help us financially to do the work, shouldn't we try for it?' and then, unfortunately, you stop thinking about putting your own time and money into a project, when the city just might offer you $5000 to do the project. I mean, they're not going to reimburse you for what you've already done, so why continue? Here's why: Because we stopped the project and it's a year later and I just couldn't take the 'front yard' looking like a horrid mess for one more week. We've waited a year for the city to process the grant application. So the moral of the story is this: if you're going to do it, just do it. Nothing is free. So in the Spring of 2012, long before we started whacking away at the slab, or even thinking about cutting into it, we received nine huge blocks of historical limestone. Nine very heavy blocks of limestone from Covington homes, that had been demolished for various reasons, but had the fancy bits (mostly front steps, we believe) saved for posterity. Or in our case, it just saved our posteriors. It took four trips and four guys to move them. Now, you have to realize that although they were all approximately 42" in length and had one side measuring 8" wide, we did have a six footer length one, and they all had varied depths. We easily determined that the 8" side was the commonality, and that would be the width of our limestone boundary. Then it got tricky. The plan was to dig down around the perimeter of what was the slab about 10", lay down about 6" of gravel, and place the limestone on top. This was to help prevent heaving over time. The problem was that from the East to the West, the property line next to the sidewalk dropped about 6" over 15 feet. 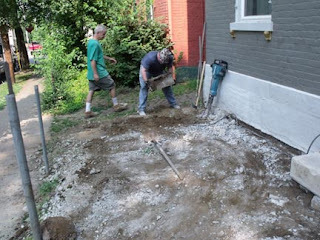 This means we needed to adjust the digging depth so that the tops of the limestone steps were level all the way across the front... after all, we are going to install a wrought iron fence on them (eventually). Part two of the problem was that, as mentioned previously, the depths of the stones varied from 9", 9.5", 10", 10.5" and up to 13" on the six-footer. So not only did we have to compensate for the slope of the ground, we also had to compensate for the varying depths of the stone. 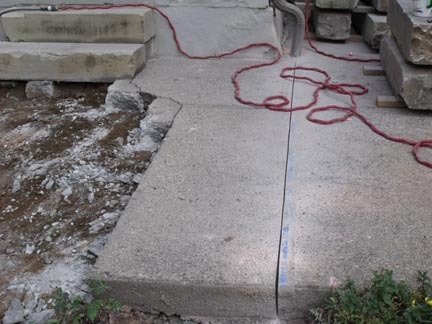 So I set up a level line based upon a predetermined low point, (which was actually determined for us by being a massive piece of concrete we just couldn't remove) numbered the limestone steps with their measurements, and set a deadline for the stones to be moved. The deadline was March 30th. Meaning, the stones got moved by 3/30, or DH was dead meat. The last week of March, the digging had begun. We had .9/ton of gravel delivered for $64 from Ideal Supplies, Inc. in Ludlow, KY. We laid out a tarp on the sidewalk, and the driver nailed it perfectly. We also had six 40# bags of dry concrete mix delivered as well. As a last minute thought, we decided to use concrete mix as a small particulate leveling agent on top of the crushed limestone, which will hopefully also prevent partial heaving and cracking down the road. We started with the biggest 6' block, moving the blocks with long orange arm-brace moving straps we'd seen the guys use on 'Ask This Old House'. We started on the far west side of the house and moved around to the front, making sure each varying depth matched the level line at the top of the blocks. We used a 2' level for the long length level, and a 6" level for the side to side leveling. Each block needed minor adjustments, but it helped to level the gravel and dry concrete mix as much as possible before placement. Oh, and before we moved the blocks, I marked each one of them to show which side was the top, and marked them each with a North/South or East/West marking so that there was no confusion as to which way the blocks were supposed to be put in place. With blocks this heavy, you don't want to have to figure it out mid-move. After a few hours and a lot of water being consumed, all of the blocks were in place. We decided against placing the last two on the east side of the house right now... eventually they should continue across the front of the house once the rest of the breezeway slab is removed... but that's phase two. For now, we dumped the larger of the remaining blocks in front of the steps, seeing as how it looked a little 'off' now that the slab was gone. Eventually, we'll level it and set it on bricks to raise up the height a few inches, but for now... it's in place. I swooned for at least an hour. DH gets to live. Yay! The following weekend I ordered 2 cu. yards of garden soil/mulch mix delivered from H. Haffner & Sons (http://www.hafners.com/) for about $145 delivered. Again, I over-ordered, but after moving about seven wheel barrel fulls of soil into the backyard, we were ready to start a garden. 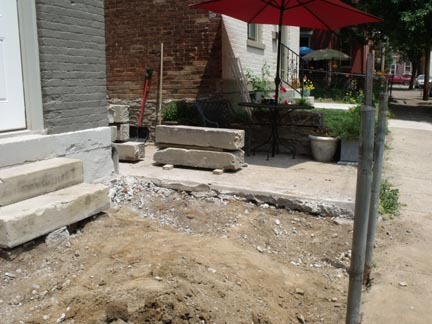 BTW: a/o 4/19/13 -- there's a guy in Clifton (Cincinnati OH) who has dozens of similar pieces of Sandstone. His ad is on Craigslist. I made this for the second time last night and found my version (especially the addition of the tomato paste and Worcestershire) to be so darned good and easy that I had to share. Just give this dish enough time to cook. Making this a day ahead only makes it better. Making a double batch gives you leftovers that make fantastic, elegant lunches or dinners when you don't want to cook. Cut your chuck into 1 1/2"-2" pieces, and trim any excess fat. Leave a little meat on any bone or connective tissue and save that too. Preheat a large heavy-bottomed saucepan or Dutch oven over medium-high heat with the grape seed oil. Pre-heat the pan and arrange the flour on a large dish. Season the cubed beef with some salt and freshly ground black pepper and then toss in the flour to coat. Shake off the excess flour and add the beef chunks in a single layer to the hot pan, being careful not to crowd them. You want fond, so you want browning. Thoroughly brown all of the cubes on all sides. If you have any bones or connective tissue from the roast (no fat) brown them too. You may have to do this in 2 or even 3 batches. It's worth it. Remove to a plate and reserve. Add the tomato paste to the pan and the diced onion. Sprinkle a pinch of salt and stir. Cook for about 5 minutes, stirring regularly. The onion should be soft just slightly browned. Add the wine and some of the stock and bring up to a simmer while you loosen the browned bits. I use a wooden spatula for this. Add the rest of the stock, the browned meat, Worcestershire, soy, demi glace, thyme, garlic, ground clove, freshly ground black pepper to taste, bay leaves and 2 cups water. Pre heat the oven to 350'. Bring the mixture up to a boil, then cover and place in the oven 2 hours. After 2 hours, saute the mushrooms in a pan with olive oil, a dash of salt, and a bit of thyme until the mushrooms are lightly browned. Pull the stew from the oven and add the mushrooms. If it has cooked down too much add a bit of water. De-glaze the pan with a splash of wine or even water and add the mushroom fond to the stew too. Dump in the potatoes, baby carrots, chopped parsley, and pearl onions. Taste for seasoning. You may need to add a bit of salt. If the stew tastes a bit tart from the wine, add the port to improve the balance. Bring back to a simmer and return to the oven for 30 minutes or until the vegetables and meat are tender. Add the frozen peas 10 minutes before serving. Remove the bay leaves and thyme sprigs. To serve, place the stew in a soup bowl, garnish with parsley and fresh ground pepper. Bread is optional, but you may want it to get the last bit of stew out of the bowl. Serve with a robust red wine. 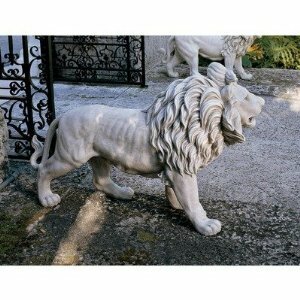 I want a front yard. Still. Oh, where has the time gone? A whole season has gone by and we seem to be back where we started LAST April. Ugh. We'd shifted a lot of our attention to our facebook pages, and have been keeping in touch with friends and neighbors, but when it comes right down to communicating a story... there's nothing like a blog. ...where we left off. As I said before..... Ugh. 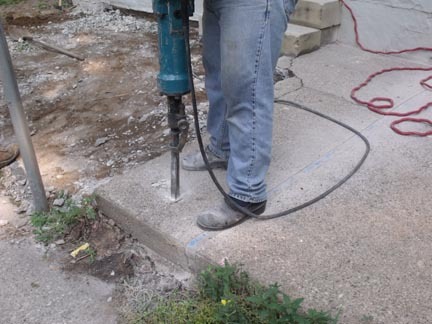 So, I re-read my last post and we were about to start work on our front concrete patio slab.... more specifically, tear it all out. Also in the plan was to tear down the awful chain link fence. 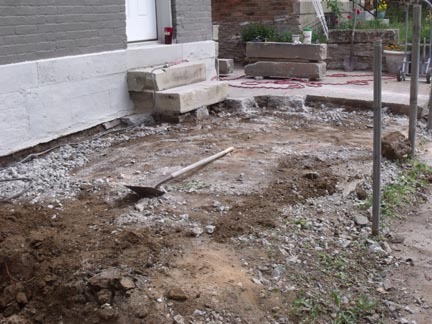 The plan also included designs to tear out the breezeway concrete and recreate a stamped concrete (brick-like pattern) all the way back to the garden. It was an impressive (and lofty) goal. So we did what anyone in our situation would do. We broke up the plan into smaller phases and got to work. Soon after our last post, we clipped the chain link fence apart and chucked it out with the poles for the scrappers. The problem was that several of the poles were embedded in really big chinks of concrete, especially where the front gate was. Not that we didn't expect that; we just cut the other poles off at ground level and planned on using the front gate poles as leverage (leaving them intact) to get those meteors of cement out after the slab was gone. So, chain link fence gone. Next : the concrete slab. This is where pure robust energy and drive got in full gear, got behind me, and kicked my arse. Ok, since this is intended to be an educational blog, I'll tell you what I did. Coincidentally, I will also be telling you what NOT to do. Kind of clever how it works out that way with me sometimes, eh? 1. First, get an eight pound sledge hammer. 2. Start whacking away at a 30 year old slab of concrete chipping away fist sized chunks of slab until your back gives out. 3. Spend a week with a blown out back unable to move. 4. Then, after a month of healing and relearning to walk upright, you beg your very kind neighbor to help your husband with a rented jackhammer. My recommendation is to skip right to step four. Needless to say, I barely touched the jackhammer. The guys worked it over pretty hard, and vice versa. It took ALL day, and the slab was only 10 x 18. To be fair, we did not plan on taking out the entire slab all at once. That was just too much of a project for us and we were not prepared to demo everything. DH borrowed a 12" concrete saw and cut a 10' line through the concrete, effectively cutting our project into 2 sections: the part directly in front of the house, and the breezeway. Once we had a 2" cut line through the concrete from the sidewalk up to the house, it was pretty easy to determine what had to go. Hence, the jackhammer. We also rented a 9 cu. yard dumpster for the job, the smallest we could get. It's pretty amazing how quickly concrete can fill up a dumpster. We needed it. While the guys broke up the slab, I gingerly chucked small pieces into the dumpster. I was still on the mend and no intention of a repeat performance of moronic proportions. We started early and finished late. It was not easy work, but I do know it was a lot easier (and exponentially more successful) than playing whack a mole with a sledge hammer. It literally took the guys about 20 minutes to bash apart what had taken me weeks to do. 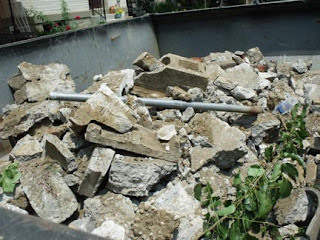 So, after the part of the slab in front of the house was in itty bitty pieces and assembled peacefully in the dumpter... we came across a spot of bad news. There was a lot more concrete buried underneath. 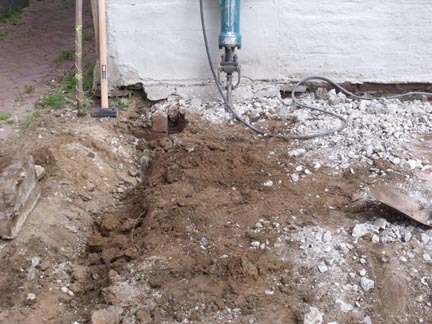 The good news is that it turned out to be mostly cinder blocks and fence post support base, but those had to be dug out, and broken up, and we needed to return the jackhammer to the rental place (Steffin's Tool Crib on Pike Street) -- but it was still a lot more work than we expected. The old adage of, 'expect the unexpected' was definitely at play here. We figured there might have been a porch at the front of the house. There seemed to be enough support for it. It took another week to dig out the rest of the concrete blocks and chunks. 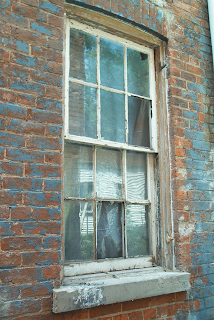 Then we found out about the City of Covington's Facade Grant... That REALLY put things on hold for a while. . . . . .